Older Japanese people have a sense of honour, dignity, and respect that MANY of today's younger cultures could/ should learn from. The Fukushima meltdown was so bad, they still haven't been able to locate the bulk of radioactive material in the ocean before the robots they use short out. Japan is awesome. In many ways. This is actually a standard thing for radiological events. How do we unnuke japan? 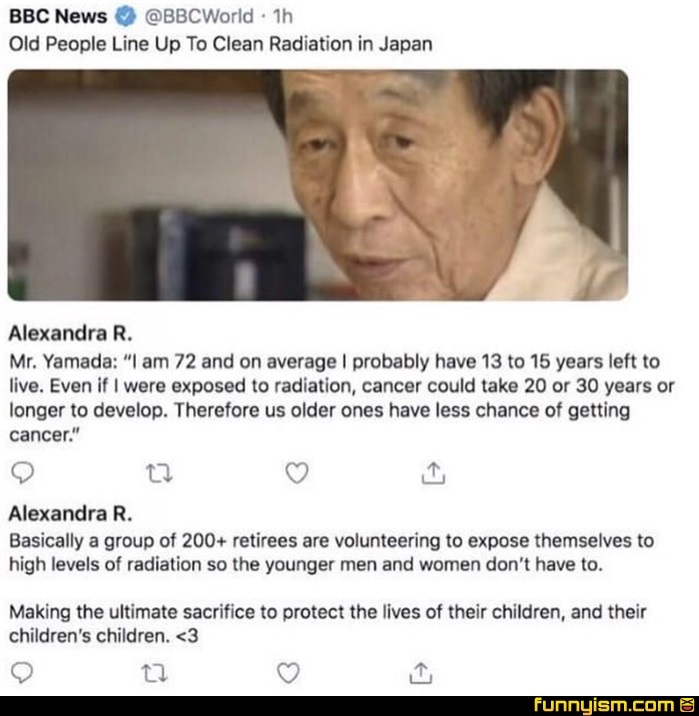 Wouldn’t the massive levels of radiation still cause the old people to become immediately and violently ill? Cancer isn’t the only problem with radiation. They also have seen the turn of Japanese interests in anime and decided they don't want to be on this planet anymore.